A Splendid New Release and a New Free Book! Our new release for you this week, Reformed by the Scotsman, is a highly enjoyable historical romance from Katie Douglas which tells the story of a wayward English girl and the firm-handed Scottish gentleman given the task of teaching her to behave like a lady. 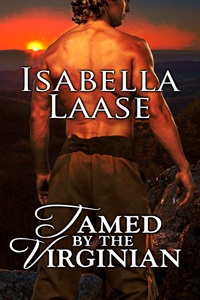 The beginning of a new month also means the start of a new free serialized novel, and in August we're excited to bring you Tamed by the Virginian, a wonderful time travel romance from Isabella Laase. The first section is available below. When her scandalous behavior finally forces her wealthy parents to take drastic action, twenty-two-year-old Adeline Hawthorne is sent to Edinburgh to live in the home of her father’s friend Edward Wolstanton. The stern Scotsman is tasked with correcting the recalcitrant young lady by any means necessary, and it isn’t long before Adeline is taken over Edward’s knee for a painful, embarrassing spanking. Though she quickly discovers that her new guardian will not hesitate to punish her as thoroughly and shamefully as he sees fit—even stripping her completely and applying a leather tawse to her bare bottom when she attempts to escape his custody—Edward’s firm-handed dominance arouses Adeline deeply. She soon finds herself wondering what it would be like to have such a man as her husband, but will he ever see her as more than a wayward girl in need of reform? Publisher’s Note: Reformed by the Scotsman includes spankings and sexual scenes. If such material offends you, please don’t buy this book. Loki Renard's new book, The Dragon King's Pet, has made the Top 100 in the Science Fiction Romance category on Amazon! Congratulations, Loki! Emily Tilton's new short story, The Oak Street Method, spent some time yesterday in the Top 100 for the New Adult & College Romance category on Amazon! Congratulations, Emily!